"Bread with blueberries in it. This bread is very good right out of the oven, or toasted." Mix together beaten eggs with the sugar. Add milk and melted shortening or vegetable oil. Sift together flour, salt, and baking powder. Combine mixtures, stirring only until blended. Carefully fold in fresh or frozen blueberries and broken walnut pieces. Pour into greased 5 x 12 inch loaf pan. Bake at 350 degrees F (175 degrees C) for 50-60 minutes. Cool in pan but try to turn it out of pan before it is totally cool. It will be easier to remove. Can also be made in a normal size loaf pan or can be made into 2 pans. Blueberries and zucchini are married perfectly in these summertime loaves! My family really enjoyed this! I was glad that I followed the suggestion of others and added vanilla and cinnamon! I just love this site! This bread is so good! 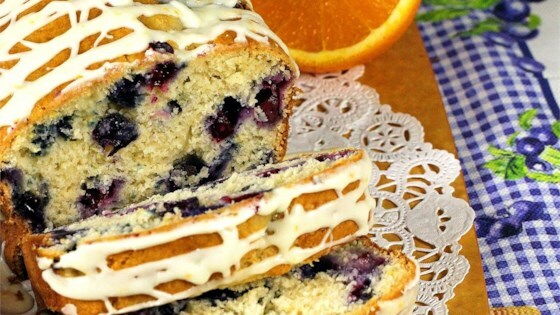 It has a good flavor and tastes like a blueberry muffin, but in a loaf. Just put a little butter on it and it is delicious! Thanks for the recipe.